I’m a baseball fan from way back, and grew up as a Braves fan during the early years of their 1990s NL East dominance. As much as I always enjoyed following the sport as a casual fan, I’d never studied the game much, nor its history beyond the bits that are conventional knowledge to anyone with an interest in the sport (the seminal records, player achievements, and legends of the game). I’ve been on a kick lately of reading about sports I enjoy—baseball and soccer—and have picked up a few books on the subjects to find out what I’ve been missing. I just finished reading George Will’s Men at Work: The Craft of Baseball, his 1989 book that dives deep on the strategy of the game. He sits down with 4 separate professional baseball men to analyze the sport and its component parts: managing with Tony La Russa, hitting with Tony Gwynn, fielding with Cal Ripken, Jr., and pitching with Orel Hershiser. One of the first things that attracted me to this as a re-primer to a newfound interest in baseball is that it’s not new. This book is over 20 years old, so most of the players mentioned in the text are ones I grew up watching. The book offers a deep analysis of the tactics of baseball games. Rather than write about the specifics as an armchair expert, the author leaves most of the opinion about the elements of the game to the actual practitioners. He poses the question and lets La Russa’s 2,700 wins or Gwynn’s 3,000 hits do the talking. Will does pepper in some of his own opinions on things like the practicality of the designated hitter rule (he thinks pitchers hitting in the NL is a waste of time), and that Walter Johnson is hands-down the best pitcher to have played the game (a bold position, but not a surprising one). But it’s by no means a book of opinion on the game. He spends a lot of the book’s introduction emphasizing the differences between baseball and other sports. No one would deny that baseball is extremely different than the other Big Three US sports, all of which are “get object to the other side to score” games. All of those sports have depths of complexity in and of themselves, but the important differentiation isn’t about which sport is “harder” or innately “better”. He points out that baseball is the only sport where the defense initiates every play—pitcher throwing to batter. This shows that no matter how dominant or overpowering a particular hitter is, he only gets 1 of every 9 team at-bats. One offensive player simply can’t dominate the entire game on behalf of his team if the other eight are consistently striking out. In football or basketball, the ball can be dished to the same runningback or power forward each play, if he’s dominating. The only player on the baseball field that can dominate is the pitcher, a part of the defense. I love these dynamics of baseball games, with each pitch functioning as a set piece with strategies set up for each hitter, count, baserunner position, batter tendency, and stadium configuration. A typical baseball game consists of 300 pitches or more, so the intricate interlock of the game’s components is incredibly complex when trying to compete at the big league level, for 162 games a season. Spahn was one of a group of former All-Stars who were in Washington to play in an old-timers’ game. Spahn said: “Mr. Speaker, baseball is a game of failure. Even the best batters fail about 65 percent of the time. The two Hall of Fame pitchers here today (Spahn, 363 wins, 245 losses; Bob Gibson, 251 wins, 174 losses) lost more games than a team plays in a full season. I just hope you fellows in Congress have more success than baseball players have. The pros that get on top are the ones that overcome the ridiculous rate of failure to edge out the competition. Much is said in the game about “luck” as an immovable fixture of the sport. You can’t watch a broadcast or listen to a manager’s press conference without them talking about luck or misfortune. Analysts in the last 10 to 15 years have created an entire science out of developing statistics that remove luck from the equation when measuring a pitcher, fielder, or hitter’s effectiveness on the field. Part of the reason luck becomes an interesting “metric” when analyzing the sport is the sheer number of individual events in a baseball season—pitches, hits, strikeouts, runs, stolen bases, the list goes on and on. A season is 2430 games, not including the playoffs, so there’s an enormous amount of data streaming out continuously, ripe for analysis. Because of this, baseball is a game of numbers and averages (with a “steadily thickening sediment of statistics”, in Will’s words). Lots of current baseball writing and analysis is overrun by esoteric sabermetricians hyperanalyzing the game in such ridiculous detail that casual fans wouldn’t even understand the meaning of the numbers. Look at stats like wins above replacement (WAR), batting average on balls in play (BABIP), or ultimate zone rating (UZR) and try to understand their meanings without detailed study. 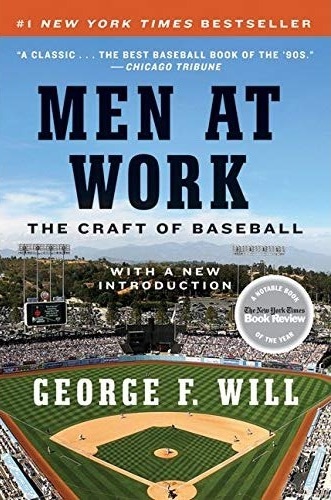 With Men at Work, I liked that Will’s approach was closer to the surface in reflecting on the practical aspects of the game, rather than the in-the-weeds examination of player performance and team contribution that’s become commonplace in the post-Moneyball era. There’s certainly no shortage of statistics or an appreciation of their importance to the sport, but they take a backseat to the observable strategies and decision-making processes of a La Russa or Hershiser. My favorite part about baseball statistics has always been looking at historical trends in player output, and many of the old school numbers work just fine for seeing individual and team performance. I highly recommend Men at Work to anyone interested in baseball, and particularly more avid fans of the sport. This book deepened my appreciation of the game, and now makes me think differently about strategies unfolding on the field.